Offer Applicable Snapdeal.com/m.snapdeal.com and Snapdeal App. The Minimum transaction size to be eligible for discount: Rs 1,000. Please check the product page Offer Section to check the validity of the offer. 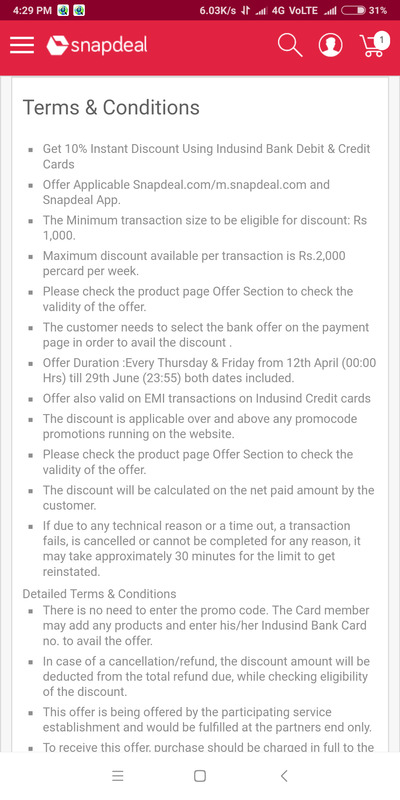 The customer needs to select the bank offer on the payment page in order to avail the discount . Offer Duration :Every Thursday & Friday from 12th April (00:00 Hrs) till 29th June (23:55) both dates included. The discount is applicable over and above any promocode promotions running on the website. If due to any technical reason or a time out, a transaction fails, is cancelled or cannot be completed for any reason, it may take approximately 30 minutes for the limit to get reinstated. There is no need to enter the promo code. The Card member may add any products and enter his/her Indusind Bank Card no. to avail the offer. In case of a cancellation/refund, the discount amount will be deducted from the total refund due, while checking eligibility of the discount. This offer is being offered by the participating service establishment and would be fulfilled at the partners end only. To receive this offer, purchase should be charged in full to the Indusind Bank Card . No cash alternative is available. This offer is being made purely on a best effort basis. The Card members are not bound in any manner to participate in this offer and any such participation is purely voluntary. Bank is neither responsible for availability of services nor guarantees the quality of the goods/services and is not liable for any defect or deficiency of goods or services so obtained/availed by the Card members under this offer. Any disputes with regard to the quality of goods/services availed shall be taken up with the merchant/service establishment directly. Bank shall have no liability, whatsoever, with regard to the same. Bank shall not be liable, whatsoever, for any loss/damage/claims that may arise out of use or non-use of any goods or services availed by the Card member under this offer. Bank & Snapdeal reserves its absolute right to withdraw and/or alter any of the terms and conditions of the offer at any time without any prior notice. Nothing expressed or implied in the program shall in any way waive or amend any of the terms and conditions of the existing Card member agreement with the Card issuer. Any disputes arising out of and in connection with this program shall be subject to the exclusive jurisdiction of the courts in the state of Delhi only. All offers are subject to partner terms and conditions. Going by the current scenario it seems uncertainty prevails. Everyone just shop from snapdeal. So, they can provide woohoo. Can anyone help me with the indusland card ? can – snapdeal gift vouchers be use to buy woohoo gift voucher ??? Maximum discount available per transaction is Rs.2,000 percard per week. Dont worry.. its over now..